Trump had been asked if he had “demonised immigrants” with his campaign rhetoric. Trump during today's press conference. US PRESIDENT DONALD Trump verbally attacked a CNN journalist at a post-midterms press conference today, labelling him as “a terrible person” and repeatedly telling him to sit down. The outburst came as Trump addressed reporters in the White House after yesterday’s midterms in which Republicans lost control of Congress. During the press conference, CNN’s Jim Acosta sought to ask Trump about his campaign in the past couple of weeks, when the president sought to make the migrant caravan moving through Mexico a central point of the campaign. Acosta asked Trump if he felt he had “demonised immigrants” with his claims and rhetoric while on the campaign trail. 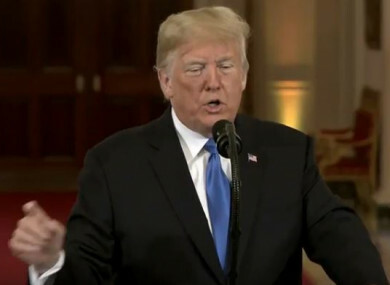 Trump first answered the question by saying that he was not opposed to immigration, only illegal immigration, before losing patience when Acosta attempted a follow-up question. “Honestly, I think you should let me run the country, you run CNN. And if you did it well your ratings would be much better,” Trump said. I’m not concerned with anything about the Russian investigation because it’s a hoax. Put down the mike. “I’m telling you CNN should be ashamed of themselves having you working for them. You are a rude, terrible person. You shouldn’t be working for CNN,” he added. Just sit down please, when you report fake news, which CNN does, you are the enemy of the people. Trump has been roundly criticised for his criticism of the media in general and CNN in particular. A fortnight ago, a Trump supporter was charged on suspicion of sending mail bombs to critics of Trump, including CNN. Beginning the press conference, Trump claimed that Republicans had “defied history” with the results of yesterday’s midterms. Republicans lost control of the House of Representatives to Democrats in the midterm elections but increased their majority in the Senate. “It was a big day yesterday, an incredibly day. And yesterday the Republican party defied history to expand our Senate majority while significantly beating expectations in the House,” he said. Trump also called out Republicans who did not win seats yesterday and who Trump claimed did not support him. Email “'You are a rude, terrible person' - Trump attacks CNN journalist at post-midterms press conference ”. Feedback on “'You are a rude, terrible person' - Trump attacks CNN journalist at post-midterms press conference ”.